Let’s get the negativity out of the way upfront: Cave of Forgotten Dreams’ 3D effects – although philosophically understandable – are nevertheless frequently murky, rendering the dark cavernous spaces and fitful lighting even more obscurant, as well as inconsistent – resplendent during swooping outdoor crane shots that establish a feel for the surrounding landscape, and essential for caressing the cave walls’ recesses and promontories, but downright pointless for the numerous talking-head interviews and other ancillary scenes. Add to this jarring shifts in film stock (and thus quality) and you have the recipe for an occasional eyesore. Now that the necessary amount of spleen has been vented, we’re in a better position to assess the finer points of Herzog’s otherwise impressive documentary. The caves at Chauvet were discovered in 1994 by a team of French speleologists. The artwork that adorns its walls dates from a period around 30,000-35,000 years ago, far older (by a factor of three or four) than similar caves at Lascaux or Altamira. Filming conditions were demanding: access to the cave was limited to a few hours a day, special equipment (such as battery-operated lights that gave off no heat) was required, and the crew had to keep to areas accessible via a metal track laid down by the scientists. Vertiginous establishing shots of the surrounding Ardèche region invite Herzog’s speculation upon the role of the “artistic staging of nature” in the choice of the site, thus introducing one of the film’s signature themes: the symbiotic relations between mankind and its natural environment. Herzog envisions the nearby Pont d’Arc natural bridge as a sort of proscenium arch, setting the stage as it were for ritualized performances, a prehistoric analogue to Wagner’s Bayreuth, and furthermore evoking the Romantic landscape paintings of Caspar David Friedrich (an aesthetic precursor also invoked in The Enigma of Kaspar Hauser  and Heart of Glass ). According to eminent pre-historian Jean Clottes, attempting to recreate the mindset of the cave artists from the scant archeological record, artistic figuration must be seen as somehow essential to humanness – therefore “communicating with the future” reveals two fundamental factors in their worldview: the fluidity of conceptual categories (living/dead, natural/supernatural) and the resultant permeability between realms that modern humanity often consider irreconcilable oppositions. A wonky postscript informs the viewer that the hot-water runoff from a nearby nuclear reactor is creating an anomalous tropical biosphere in the middle of the French Alps, replete with mutated albino crocodiles, thus reaffirming Cave’s dominant theme of the mutual infringements of man and nature. One of Herzog’s characteristically quirky asides, pondering what these anomalous animals might make of the Chauvet Cave, were they ever able to penetrate into its precincts, recalls the notorious “iguana cam” shots in his earlier Bad Lieutenant: Port of Call New Orleans (2009), substantiating an abiding interest in what exactly a nonhuman (if not exactly inhuman) viewpoint might resemble. 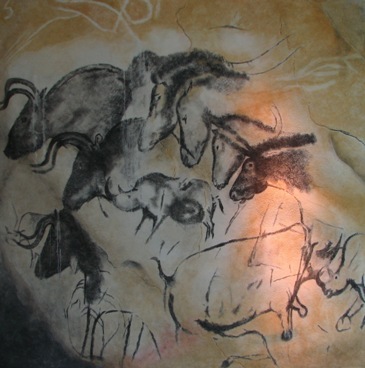 This entry was posted in film, movie reviews and tagged 3-D, ancient art, art, art history, cave of forgotten dreams, cave painting, chauvet cave, cinema, cinema reviews, documentary, documentary film review, film, film criticism, film review, film reviews, France, Germany, history, movie, movie reviews, movies, werner herzog. Bookmark the permalink.